Metro has just issued a press release warning motorists to be careful near the soon-to-open Orange Line Extension or risk being ticketed. Safety education is the goal but LAPD and LASD are carefully monitoring the area and will issue tickets to violators. Motorists and pedestrians take note: During pre-revenue testing along the Metro Orange Line Extension the Los Angeles Police and County Sheriffs departments are strictly enforcing traffic laws and will continue to do so after the four-mile busway opens this summer. 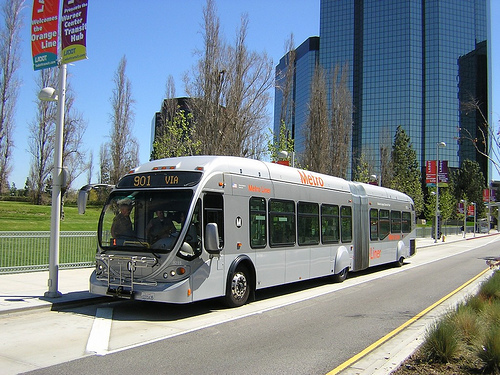 To stress caution and careful behavior, Metro also is reaching out through newspaper and web advertising and public safety messages to schools, homes, community centers and businesses near theSan Fernando Valley busway extension. The Extension is an addition to the popular Orange Line that currently runs from the Metro Red Line Station in North Hollywood to Warner Center in Woodland Hills. It will expand the line north from the existing Canoga Station to the Chatsworth Metrolink Station, linking Ventura County with the L.A. County Metro system. As with any new mass transit line, the public needs to develop behavior patterns that will help keep it safe. The police and sheriffs presence, combined with Metro outreach, is aimed at promoting driving, walking and biking safely along the line between Canoga Station at 6610 Canoga Ave. and the Chatsworth Metrolink Station at10047 Old Depot Plaza Road. Safety training began in March at K through 12 schools within a 1.5 mile radius of the line, at public libraries, senior centers and recreation and community centers. More than 10,000 safety notices are being distributed to homes and businesses throughout the area and community education will continue after the summer opening. — Obey ALL warning signs and traffic signals when crossing the busway intersections. — Be alert at all times when near the busway. — Watch for buses from both directions. — NEVER walk, run, ride bicycles or drive on the busway. — Remember to push the pedestrian crossing button to activate the “Walk” signal. — Use the crosswalks. Never jaywalk across the busway or use the busway as a shortcut. — Always look both ways before crossing the street. When the Orange Line opened in 2005, 7,000 to 8,000 boardings a day were predicted. Now there are more than 25,000 daily boardings. For more information on the Metro Orange Line go to metro.net/projects/orangeline.